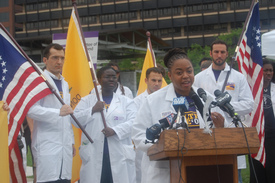 PHILADELPHIA — Doctors from the Committee of Interns and Residents/SEIU Healthcare joined other doctors, nurses, medical students and health care advocates in a rally at Independence Hall here this week to demand quality, affordable health care for everyone. Resident physicians, who staff our cities’ anchor safety-net hospitals, are at the front lines of the nation’s crumbling health care system. They provide the majority of care for the nation’s uninsured and underinsured population. The resident/intern union represents more than 13,000 hospital staff physicians across the country. To establish justice, by eliminating disparities in access and quality of health care resulting in inferior outcomes based on race, ethnicity, language and culture. To ensure domestic tranquility, by adequately funding safety-net hospitals in underserved communities, protecting them from damaging budget cuts at the state and city level, and fighting to prevent hospital closures in overburdened communities during these tough economic times. To provide for the common defense against preventable chronic illness by investing in preventive care, children’s health insurance, sufficient staffing, better equipment, health information technology, language services and medical research. To promote the general welfare, by developing a physician workforce that is representative of the population of the country, making medical school and residency sustainable and affordable for people from all racial and economic backgrounds, and start solving the primary care crisis by an increase in compensation for primary care physicians. And to secure the blessings of good health and liberty to ourselves and our children by urging Congress and President Obama to finally enact a comprehensive health care reform bill this year. The Committee of Interns and Residents kicked off its national convention here this week. More information about CIR can be found at .